I need some advice on dough storage. 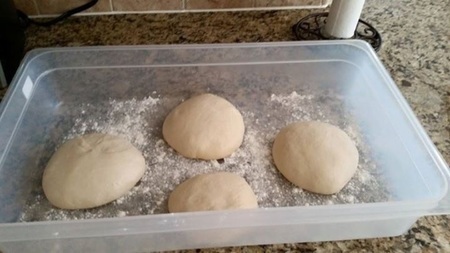 If I put the rolled dough balls on a regular aluminum half sheet tray should I put it on parchment paper, flour, straight on the aluminum, etc... Basically I want to know what the dough should be sitting on if I have multiple doughs on one tray. I wrap it tightly and the balls are moistened with a drop of water. Is a damp towel on top a good idea? Also if I do a several day fermentation is there a benefit to doing it as one big mass and roll the dough into balls closer to needing it or is it better to roll it and let it sit for several days as smaller balls? Great questions Greg. If you're using an aluminum tray, there's no need for parchment. You should get yourself a plastic dough scraper though. They're dirt cheap and will be very helpful for separating the dough ball without altering its shape. I'd skip the damp towel. If plastic wrap is working, stick with it. If not, let us know what issues we're having and we can troubleshoot. As for bulk fermentation, it's a matter of preference. It's done both ways and you can get good results with both. In the Pizza Bible, Tony makes a very strong case for it and mentions that you end up with a "lighter, crispier and more flavorful" end result with a stronger structure. I bought a plastic tray and lid at a local restaurant supply store last week. It fit in my refrigerator and the dough didn't stick. There was one problem though. There are several circles on the bottom with rough edges created by the mold it was made from. They did catch the dough a little. Someone on another site told me about Doughmate trays sized for home use that supposedly don't have this problem. The price isn't bad and they look good. They even have a lot that includes two trays, a lid and a scraper. I'm going to order them and see how they work. I think that's where I got mine. Really good boxes. Very smooth and the quality is awesome. I had considered purchasing the same unit. The shipping is high, but then again, it is the only game in town that size that I have found. What I settled for was aluminum dough pans, about 8" in diameter, which have individual lids or are stackable. At first, I thought I had made a mistake--that they were too large--but as I have begun making larger doughs, they are working well for me. I also think that because they are metal, they will chill more quickly. I have not done as experiment with a thermoprobe yet, but I am enough of a geek to do that sort of thing. Ken, I thought the same thing when I saw the flour. I kept getting a crust when I dusted with flour because when I started out I thought wet was bad. Now I wipe a thin layer of oil on the bottom of the pan, spray gently with water and wrap tightly. Works out great for me now. My NYC sized refrigerator won't accommodate stacked dough pans so I use a 1/2 sheet tray. Six 225-250g dough balls fit perfectly. I purchased some EVO sprayers on amazon for olive oil and use those to spray the containers before placing the dough in them. I then spray a thin layer of oil on the top. Because I like to use it, I then use a T-Rex sprayer that I purchased years ago from Alton Brown's website to add a little humidity to the container. I am sure it is overkill but the sprayer is a hoot...! The flour I have sprinkled is on the bottom of the container, not the top of the dough balls. I had never used this container before and I was concerned about sticking. As it turns out, the flour probably wasn't necessary. The container has snap-on lid and there was no drying out at all; a nice film of fine condensation even formed inside the lid. "there was no drying out at all; a nice film of fine condensation even formed inside the lid."